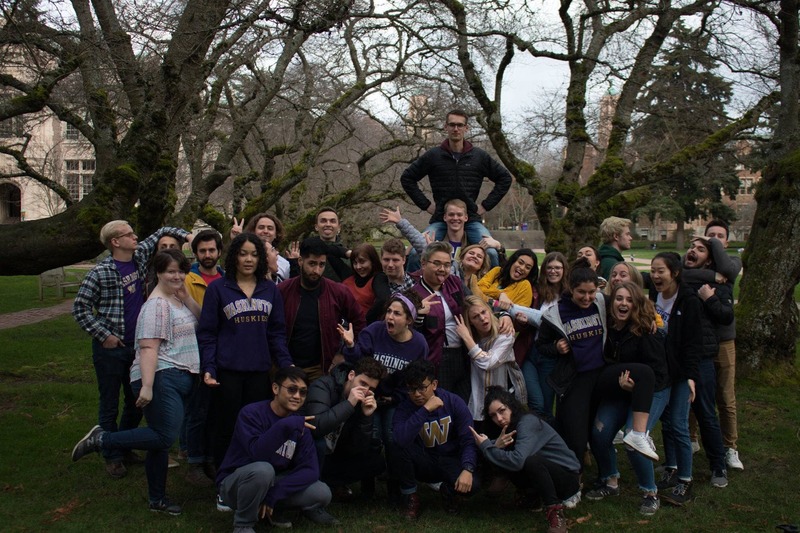 Western's A Capella Club is made up of four ensembles: All Aboard, our non-auditioned mixed ensemble, Major Treble, our treble ensemble, Rebel Clef, our tenor-bass ensemble, and Pacific Note West, our competitive ensemble. Last year your support helped us do some amazing things. All Aboard went on tour to Vancouver, BC for the first time in the club's history. Major Treble and Rebel Clef competed in the International Championship of Collegiate A Capella in Tacoma and placed among the top A Capella groups in the northwest region. As a whole club we were able to organize two retreats during the year, which allowed us to make significant improvements in our music and create a stronger community within our club. Last year was full of exciting new opportunities and valuable learning experiences for the whole club made possible by your support. Club members feel that A Capella is a great place to make friends, and has been a strong support system for them during the more stressful times of the school year. Through connections with off campus music groups and performances all over the state, we are committed to building relationships with the community outside of Western as well. We are raising money so that we can have the financial support to continue to share our music in the community both inside and outside of Western. The money we raise will first and foremost go to supporting our members to spread our love of music through Western's community and also through the Pacific North West by reaching out and singing with other universities and local groups. Specifically, we will use these funds for transportation and hotel fees for the club's yearly tours, application fees and transportation costs for the International Championship of Collegiate A Capella, fees for booking locations for our biannual retreats for club bonding, and much more to support all members of our club and promote inclusivity. In stressful and difficult times, people often turn to music in order to ground themselves and connect with their community. It is A Capella Club's main goal to reach diverse groups of people through our music, both on and off Western's campus. With the funds we hope to acquire through this project, we aim to share our music as widely and as meaningful as possible. If you live in the Bellingham area and would like to see us perform, A Capella Club Every quarter on the WWU campus. Visit www.wwuacapella.com for more information! Below are links to the music videos created by All Aboard and Major Treble during the 2017-2018 school year if you'd like to check them out!